Hello every one, I always wanted to have a proper garden and always wanted to grow something but unfortunately in Mexico (I'm from Mexico) some houses don't have a garden but a thing called a Patio with a cement floor and instead of soil and grass you get tiles or kind of pavement. Anyway, when I came to London I started living in a shared house with a couple of people. The house is quite big - and SO IS THE GARDEN, last year my husband and I made up our minds that we should go for the 'Good Life'!!! and grow our own veggies (for those that don't know the 'GOOD LIFE', it was a television series about a married couple getting fed up of city rules and started growing their own vegetable plants to become self sufficient - so I've been told). So we did and with wonderful results - I thought so anyway and our friends did too, they didn't stop telling us how great our vegetable growing was turning out. I want to be a journalist so I decided to make a blog this year since we are growing our veggies again. So when I found this opportunity (meaning this site) I decided to join. I hope all will like and help me with what I write and please if you see any spelling mistakes please let me know. Cheers. What delicious looking vegetables! Well done! I especially love the way you've utilized all of your space. You and your husband have "growing hands". Your town spelling has been corrected as you requested. You made the right decision to grow vegetables! You and your husband obviously have 'green fingers'. 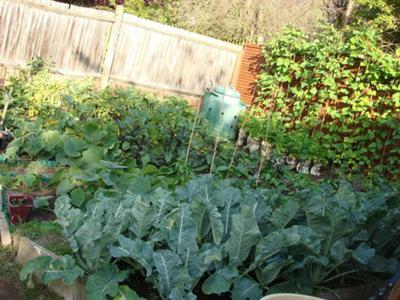 Your vegetable garden looks fantastic, I've no doubt you will have the same success this year.